What follows is the outlook for the U.S. and Connecticut economies for 2017 - 2019, which is prepared by the Office of Research, Connecticut Labor Department (CTDOL). After review by a panel of economists from academia, business, non-profits, and government, the U.S. and Connecticut outlooks are revised, updated, and then used as the basis for setting the assumptions for the next round of Short-Term Connecticut, Industry-Employment Forecasts. Archived "Conditions and Outlook for the U.S. and Connecticut Economies"
What follows is the outlook for the U.S. and Connecticut economies for 2016 - 2018, which is prepared by the Office of Research, Connecticut Labor Department (CTDOL). After review by a panel of economists from academia, business, non-profits, and government, the U.S. and Connecticut outlooks are revised, updated, and then used as the basis for setting the assumptions for the next round of Short-Term Connecticut, Industry-Employment Forecasts. What follows is the outlook for the U.S. and Connecticut economies for 2015 - 2017, which is prepared by the Office of Research, Connecticut Labor Department (CTDOL). After review by a panel of economists from academia, business, non-profits, and government, the U.S. and Connecticut outlooks are revised, updated, and then used as the basis for setting the assumptions for the next round of Short-Term Connecticut, Industry-Employment Forecasts. What follows is the outlook for the U.S. and Connecticut economies for 2012 and 2013, which is prepared by the Office of Research, Connecticut Labor Department (CTDOL). 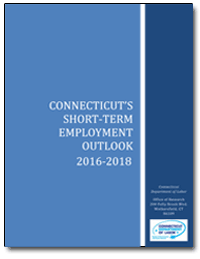 After review by a panel of economists from academia, business, non-profits, and government, the U.S. and Connecticut outlooks are revised, updated, and then used as the basis for setting the assumptions for the next round of Short-Term Connecticut, Industry-Employment Forecasts, and is posted on the CTDOL Website. In addition, every year the U.S. and Connecticut outlooks are forwarded, as required, to the U.S. Labor Department. As this is written, in June 2012, it has been three years since National Bureau of Economic Research (NBER)-designated official end of the 2007-09 Recession in June 2009. And, there is now talk of a significant slowdown, or even a recession. This recovery has followed the first U.S. systemic banking panic since the 1930’s, the first collapse of a shadow banking system since 1907, and the first succession of collapses in asset bubbles in housing and the stock market, in conjunction with unsustainable levels of household debt since the 1920’s. This resulted in what has been called a Balance Sheet Recession. The Great Depression was a balance-sheet recession, as was the recession that followed the collapse of Japan’s real estate bubble in 1989. Balance sheet recessions are steeper and last longer than non-balance-sheet recessions, and they are followed by weaker recoveries. This is the direct consequence of households and unincorporated businesses paying down unsustainable levels of debt to rebuild their Net Worth. This process has been referred to as Deleveraging. At the time of writing, the economy has experienced, what is referred to in the outlook, as its process referred to as deleveraging, which has pulled the momentum of the economy down each time it appeared that a recovery was under way. Remember Bernanke’s “Green Shoots” in the Spring of 2009? We have been here before. As of the middle of 2012, we have had at least three “recoveries” since the NBER-declared end of the recession in June 2009. The problem is that even though consumers are repairing the liabilities side of their balance sheets by paying down debt and reducing credit demand, housing prices, effected by continued foreclosures, are still held down, which means that the asset side, especially for median and lower income households, is still not recovering and thus presenting a major impediment to rebuilding their net worth. And, now it looks as if World economic growth is slowing considerably. And, with no possibility of any active fiscal stimulus getting through the Congress in this Presidential election year, and with the stimulus from the American Recovery and Reinvestment Act (ARRA) pretty much wound down, especially critical support to local governments (which, unique to this recovery, are a drag on economic growth), the prospects of any sustained recovery over the 2011-13 forecast horizon seems highly unlikely. Things look even bleaker for 2013. The Budget Control Act of 2011 could potentially push the economy over a cliff in 2013. The spending cuts scheduled to take effect because of the failure of the socalled “Super-Committee” last November will take us down the same road as the United Kingdom, which has been plunged back into recession as a consequence of Draconian budget austerity measures. And, the temporary Unemployment Insurance extension is set to expire in July 2012. And, as noted above, with the winding down of ARRA support to state, and especially local, governments, in the face of collapsing revenues, to balance their budgets, are raising taxes, cutting spending, and laying off workers, all of which, withdraws spending from the economy, and subtracts from, and therefore cancels out, some of the job-growth in the Private Sector, which, in turn, drags down the total monthly job-growth numbers. Though the housing bubble and bust did not impact Connecticut to the extent it did other areas of the country, particularly the epicenter regions, such as Miami, Phoenix, and Las Vegas, Connecticut was still affected, and in particular, certain regions of the state, with regard to subprime mortgages. However, Connecticut is still significantly exposed to the current crisis due to the large presence of the financial services industry in the state, particularly in Fairfield County. Further, Connecticut has not been immune from the states’ budget crises that have intensified going into 2012, as Federal support to the states, particularly for education, public safety, and Medicaid wind down. At the time of writing, three California cities have filed for bankruptcy. What follows is the outlook for the U.S. and Connecticut economies for 2011 and 2012, which is prepared by the Office of Research, Connecticut Labor Department (CTDOL). After review by a panel of economists from academia, business, non-profits, and government, the U.S. and Connecticut outlooks are revised, updated, and then used as the basis for setting the assumptions for the next round of Short-Term Connecticut, Industry-Employment Forecasts. The year 2008 was a historical year. The sub-prime/housing bubble and bust, in conjunction with the rapid rise, proliferation, and then collapse of the financial derivatives boom ignited financial contagion and crisis that spread to the real economy, culminating in the bankruptcy of Lehman Brothers and the collapse of AIG in September 2008. The U.S. and World economies were suddenly faced with the worst financial and economic crisis since the 1930’s. These events obviously drive the outlook for 2009 and 2010. As a consequence, what follows is an expanded outlook that includes coverage of the origins of the current financial and economic crisis. Of course, the 2008 Outlook, as well as previous outlooks, highlighted the growing housing bubble and its threat to the rest of the economy. Though the housing bubble and bust did not impact Connecticut to the extent it did other areas of the country, particularly the epicenter regions, such as Phoenix and Las Vegas, Connecticut was still affected, and in particular, certain regions of the state. Nevertheless, Connecticut is still significantly exposed to the current crisis due to the large presence of the financial services industry in the state, particularly in Fairfield County. Further, the World economy is expected to contract for the first time in 60 years. Particularly troublesome for any recovery prospects is the $13.8 trillion loss in U.S. household sector wealth, from the third quarter of 2007 to the first quarter of 2009, and the unprecedented contraction in net worth (at least in the post World War II era). The outlook for the U.S. and Connecticut economies for 2007-09, which is prepared by the Office of Research, Connecticut Labor Department. After review by a panel of economists from academia, business, non-profits, and government, the U.S. and Connecticut outlooks are revised, updated, and then used as the basis for setting the assumptions for the next round of Short-Term Connecticut, Industry-Employment Forecasts.